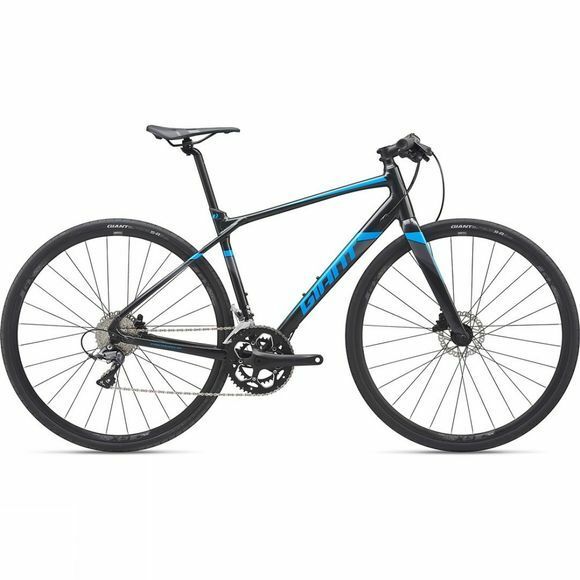 Feel like you're flying with the ultra-smooth and efficient Giant FastRoad SL 3 2019. This bike takes aspects of a sporty road bike, such as a lightweight ALUXX SL aluminum frameset and fast-rolling 700c wheels, and adds in elements of a versatile city bike. A flat handlebar puts the rider in a comfortable position that’s smooth and efficient allowing the rider to cycle with confidence and control and integrated ergo bar ends keep your hands comfortable on longer adventures. The fast-rolling 700c wheels can accommodate large tyres up to 32c, prefect for tackling rough roads, powerful disc brakes give you added control in all types of weather and vibration-absorbing composite D-Fuse seatpost helps smooth out rough roads. To add to the perfect balance of road bike speed and city bike versatility, this llightweight machine comes with easy-to-use rack mounts making the FastRoad SL 3 2019 the ideal bike for commuting, fitness riding and weekend adventures. We have a wide range of urban bikes available for all experience levels from a vast range of different brands. Ensure you're fully kitted out for your next ride.